Transportation Alternatives, NYS’s leading advocate for better biking is pleased to announce the Biking Rules education and encouragement campaign to address bicycling behavior on NYC streets. Biking Rules also has an online presence at http://bikingrules.org where cyclists can find helpful mapping tools, the rules of the road, Twitter feeds about bridge conditions and a variety of other multimedia tools that relate to biking in NYC. - The Queens Alliance has never run a shelter before. Try searching the internet for information about this organization and see what you come up with. - To file with the IRS, the Queens Alliance used an address that hundreds of other shell corporations use. They have a mailbox on Lee Avenue in Brooklyn, but they deceivingly call their mailbox number “suite 712”. Their alternate address is the address of the house they haven’t moved into yet. - The Queens Alliance told the residents of 58th Avenue that this facility will house homeless drug addicts and alcoholics who may or may not be referred for treatment. They explicitly stated that their clients have the right to refuse rehab. Homeless drug addicts and alcoholics generally have lengthy arrest records and cause problems such as selling drugs and committing crimes to get money to buy more drugs and alcohol. This is unacceptable in a community full of children. - Community Board 4 already has the most community facilities of any district in the borough. In fact, there already exists a facility on the block that houses adults with mental issues. At least 3 criminal incidents have thus far been traced to this home. So the residents protested, as would be expected when the city decides they are going to open an unwelcome facility in the middle of a residential block. Soon after the protest, the City’s Human Resources Administration quietly leaked out that their contract with the Queens Alliance was cancelled due to the organization “breaching their clients’ confidentiality.” However, they made it clear that they could reapply for a contract in the future. The Queens Alliance has vowed to reapply and house clients at the facility on 58th Avenue. They signed a 10-year lease with the owner as the contracts with the city for these facilities are generally made for 9 years. 58th Avenue. However, they did state that the Queens Alliance would not necessarily be prohibited from reapplying for an MOU for that location in the future. The Queens Alliance may also sublease the facility to another group or organization in order to cover their rent. It was suggested by the mayor’s office that the 58th Avenue Block Association enter into a dialogue with the Queens Alliance and help them find a tenant for the facility which would be agreeable to all parties involved, such as a day care center. Hopefully before her tenure as Council Member is complete, Melinda Katz will work with them to bring this saga to an amicable resolution. Videos of the Elmhurst homeless shelter rally held July 11, 2009, may be found here. Folks continue to see commuter vans driving in the Maspeth/Woodside area, communities where they are not authorized to pick up or drop off. People say the vans are pulling into private driveways, backing out of side streets, and blocking traffic while they pick up or discharge passengers. Elmhurst residents experience similar problems to a more extensive degree because the commuter vans are authorized to operate there. To complicate things, we have found out some the commuter vans that you have been seeing picking up and discharging people are not considered commuter vans. We have been told that any commuter van with “BA” at the end of their license plate number is considered a bus. At this point we assume the vans with “LA” at the end of their license plate are considered commuter vans. NYC Department of Transportation is in charge of the “BA” license plates while NYC Taxi & Limousine Commission (TLC) is in charge of the “LA” license plates. If you think that is complicated, we are now seeing commuter vans with a “T” at the beginning of their license plate number and a “C” at the end. This is now being investigated and we are curious as to what the answer will be. We have been notified that the NYC TLC has undertaken a project to revise its existing rule book. During the first phase of the rules revision project, all of the existing rules will be redrafted, then posted on a chapter-by-chapter basis on the TLC Website for review and discussion by interested members of the public. We are hopeful that we can propose some changes that will be instrumental in resolving the ongoing problems that we have been dealing with. Dominic Collucio, Special Assistant to the Commissioner has promised to send COMET President Roe Daraio a copy of the commuter van guidelines and NYC DOT guidelines pertaining to the commuter buses. Everyone in COMETland will just have to wait for the next chapter to find out if we will, in fact, unravel the commuter van and commuter bus dilemma/mystery. Over the past 3 years, the residents of western Maspeth have suggested that new park land be created in their community. Thus far, their pleas have not been answered by the city. The address of the proposed location for a new park is 57-40 58th Street – the former site of St. Saviour’s Church. This site is currently completely vacant and for sale by the owner. It is 1.5 acres of open space – an entire block of land - in a community that only has 12 acres of parkland in total to serve more than 36,000 residents. There are 1 million more people anticipated to be residing in New York City by the year 2030, many of them coming to Queens. We need to prepare now to serve their needs. Unfortunately, the needs of those currently here are not adequately being fulfilled. The area where this empty lot is located is surrounded by homes which are not within 10 minutes walking distance of a park, which is a goal Mayor Bloomberg has created as part of PlaNYC 2030. The replanting of the close to 200 trees that were present on this property would also help further the city’s million trees plan and help clean the air. Asthma and cancer are prevalent problems in our community. You’ll recall that a 30-day deadline to was given to remove the church from the property because the owners supposedly had a buyer lined up. Either that deal fell through, or there never was a buyer in the first place. With real estate values continuing to plummet, this appears to be a good time for the City, which always seems to come up with money for projects it wants to do (even in lean times), to make an offer on the property. If the City were to acquire the St. Saviour’s grounds, the church could be rebuilt at its original site, which is the ideal situation. While grateful to All Faiths Cemetery’s generous offer to host the church, there is no better location than the one that Maspeth pioneers chose for it in the first place. It was sited there for a reason and rebuilding it there would honor its place in the history of Maspeth, help foster community pride and provide a community center at the location suggested by Community Board 5 for the past 2 years. Once again, Maspeth is underserved by parks, this site is for sale and acquisition of the land by the city for use as a public park would satisfy a need for both present and future residents. This kind of opportunity to create new open space will likely never present itself again. I am currently working with elected officials and residents on a proposal to present to the city with regards to this project and the people of Maspeth expect that the mayor will work with us to make this a reality. What’s up at the “Prisoner” House? 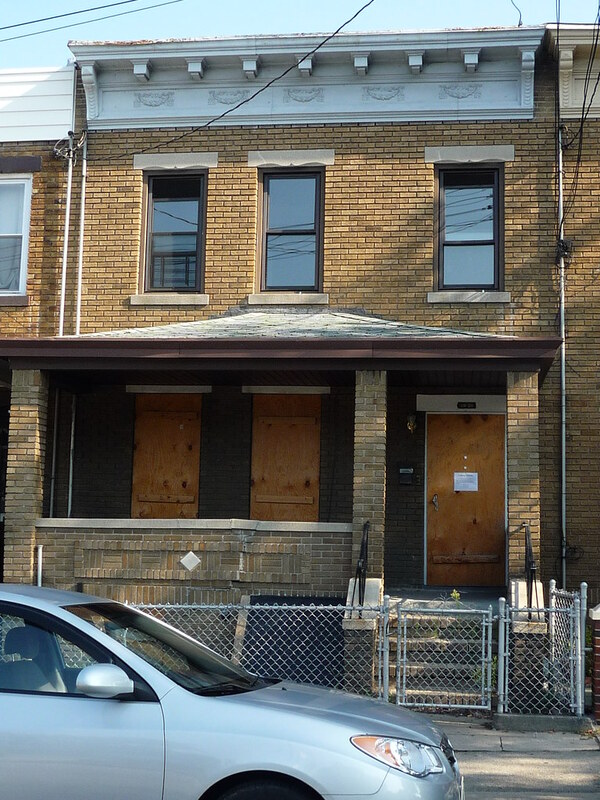 Remember the house on 58th Avenue in Maspeth that was illegally converted into a Single Room Occupancy for dozens of ex-cons and the Department of Buildings issued a “vacate order” because the house was in violation of the zoning? Well, it’s been vacant ever since. Then, all of a sudden, a sign shows up on the front door. 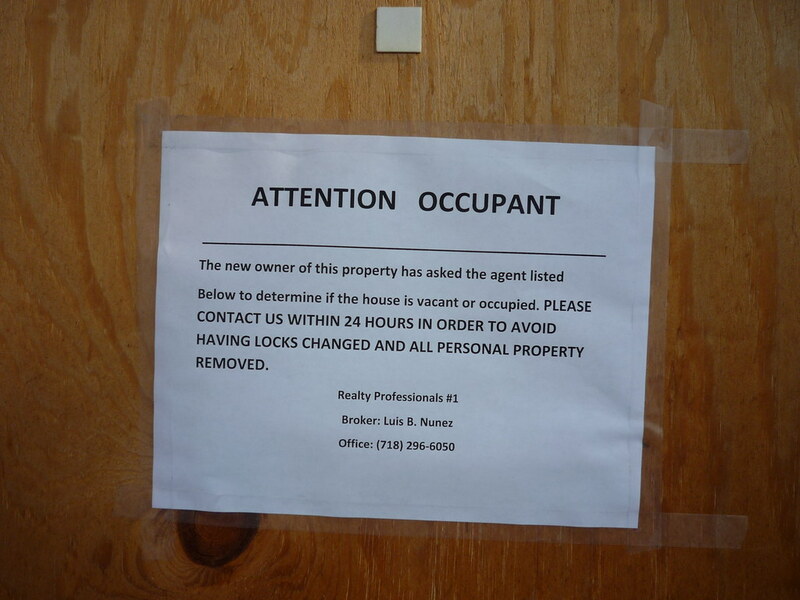 The sign reads, “Attention Occupant, the new owner of this property has asked the agent listed below to determine if the house is vacant or occupied. Please contact us within 24 hours in order to avoid having locks changed and all personal property removed. Posted by: Realty Professionals #1, Broker Luis B. Nunez, Office (718) 296-6050." The sign mysteriously disappeared less than 24-hours later. We subsequently found out the house went into foreclosure in late July. On Wednesday, August 26th, an alert neighbor spotted the broker, Mr. Nunez, who said the bank will be putting the house on the market at a reduced price. The individual who purchased the property bought it for the inflated price of $710,000 and when the property went into foreclosure about $640,000 was still owed. Maspeth Wants Better "Waste Management"
The City of New York is planning to authorize Waste Management’s garbage transfer station on Review Avenue in Long Island City which will accept the solid waste collected curbside from sanitation truck routes throughout Queens Community Boards 1-6. The waste will be delivered to the transfer station via an estimated 65 sanitation truck trips per day. Waste Management will then load the waste onto their trucks for transport to trains at the Maspeth Railyard at Maspeth Avenue and Rust Street. This will add another estimated 50 truck trips per day. The trains will then carry the waste to the Fresh Pond Railyard until it is ready for its rail journey out-of-state. While hauling trash via rail rather than truck is a step in the right direction environmentally, this plan is flawed for several reasons. - The routes that the trucks will take to the transfer station are undefined and will cause trucks to come through residential areas. For example, the Maspeth Truck Bypass Plan has yet to be put into effect by DOT and sanitation trucks heading to and from LIC drive down Grand Avenue regularly. - The same rail line that the trains will take to Glendale run right next to Waste Management’s property. Therefore it is unnecessary for them to haul it to the Maspeth Railyard. Paying Waste Management to truck the waste to the railyard is a ridiculous waste of taxpayer money, especially since the Varick Avenue Transfer Station in Brooklyn will transport their waste via rail to the Fresh Pond Railyard. There is no reason why the same can’t be done here. - The City is upgrading its rail-barge system at 65th Street in Brooklyn but Waste Management will not be utilizing that because it says their containers do not fit that system. The containers should fit the system that is least likely to cause environmental damage and adversely impact residents’ quality-of-life; the system should not be driven by the type of containers they have on hand. - The proposed plan will increase pollution and increase asthma and cancer rates as there are a number of people living near the railyard. - A document on the Department of Sanitation’s website shows way more truck trips (81 to the transfer station and 144 to the railyard) than what WM is reporting now (50 to the transfer station and 65 to the railyard). - The Vallone family of Queens political fame has collected more than $1M in fees to lobby for this project since 2002. Area civic organizations, our local elected officials and political candidates and Community Board 5 all agree that there has to be a better way to dispose of Queens’ garbage. Photos of Waste Management rally held on 7/18/2009 may be found here. Sunnyside Community Services offer a free training program to become a Home Health Aide, with immediate job placement upon completion. Contact Carmen Velez at 718-784-6160 X 338 or Melissa Vitale X 340.